Adam Langrish is a family law specialist barrister. Adam has a busy public law practice and has significant experience of every stage of care proceedings with cases concerning serious sexual and emotional abuse and non-accidental injury. Adam has also dealt with a number of cases involving the Official Solicitor as well as applications for orders for the secure accommodation of children. Following placements over a twelve-month period with the children’s services legal departments of two local authorities, Adam enjoys a healthy mix of instructions to represent parents, guardians and local authorities. Adam is instructed in ancillary relief matters as well as TLATA cases and other cohabitation disputes. Adam also has experience of applications for MPS and enforcement of orders. Succeeded in the Court of Appeal in overturning a costs order made against an absent party at a final hearing of a long-running residence dispute. The Judgment affirmed the general practice of not awarding costs in Children Act cases in the absence of reprehensible behaviour and highlighted the need for there to be adequate warning given of an intention to pursue costs. Click here to read the full case. 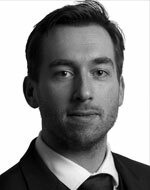 Adam Langrish is qualified to accept instructions directly from members of the public and professional clients under the Direct Public Access scheme.